Inbound vs Outbound Marketing | Which is most effective? You might be thinking, ''Oh no, not more buzz words", but wait! Inbound and Outbound marketing are the terms to describe two very different forms of marketing activity. In this article, we are going to take a look at the pros and cons of each form and look at which is most effective and critical right for your business. In general, marketing had been the same for a number of years. 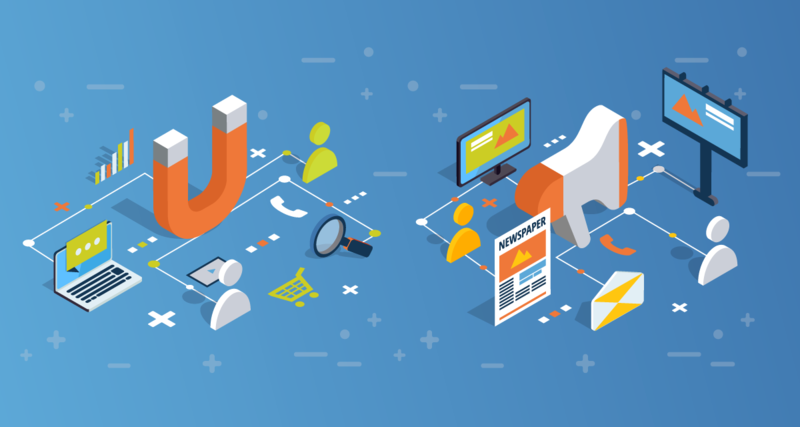 However, through the emergence of new technology, rapidly changing customer habits and increasing demand for new ways for users reach out and communicate with businesses, we are seeing a shift from traditional outbound marketing to an inbound approach. The main aim of marketing is to discover new customers and grow your business. In order to do this business will invest time, effort and considerable expenditure to highlight new audiences and reach out to them with various forms of marketing promoting their business or service. If you were to follow traditional methods of marketing, you might adopt an outbound approach, using media like print, TV and radio to help connect with your audience. As I am sure you're aware, these are no longer the most effective means of opening up communication with potential customers. They even sound boring. Today's customer is savvy and has a wealth of businesses at their fingertips all vying for their attention. If you haven’t adapted your marketing strategy to account for this, then you're missing a trick. With the growth of the internet and the innovation of Social Media, we have seen business taking Inbound Marketing Methods to new levels and having great success doing so. 'Outbound' describes any type of marketing activity where you put your promotion in a buyer’s path with the hope that it will resonate and cause a reaction. Traditional methods of Outbound Marketing include telemarketing, banner advertising, mass email marketing, but also extend to remarketing and PPC. When using an outbound approach, it's all on the marketer’s terms. The strategy will be defined with no input from the buyer, therefore the content, time and place of the interaction will be defined from the outset by the marketer. This leaves a lot to chance don't you think? There are certain circumstances when Outbound Marketing can work, but they don't really align with today's customers. Today's buyers expect full control of their buying process. With hundreds of businesses vying for their attention online they are equipped with all the tools to research, compare and finally engage with a business when they are ready to make the purchasing decision. To meet the demands of today's buyer many businesses are shifting toward an 'inbound' approach. Inbound denotes the practice or marketing techniques that meet your buyer's needs and the way they make their purchase decisions. Once they are ready, let them come to you, rather than interrupting their process. All sounds a little Field of Dreams right? “If you build it, they will come. However, in essence, that's what it is. Inbound marketing is the process of learning as much about your potential customers as possible, offering them content of value that will resonate with as its specific to their need then tailoring your communication as they move through the stages of the sales journey. By ensuring your content meets a specific need of your audience you'll generate new leads. Then by only engaging with them after they have expressed interest they feel in control. It’s a process that's also known as permission marketing, allowing the customer to choose the time & place and control their interaction. This process nurtures a strong relationship between customer and business and leads to increased opportunities. Some examples of Inbound Marketing include SEO, Emails, Blogging, Social Media Marketing & Content Marketing. Adopting an inbound approach will enable your business to attract new clients, build trust and engage with your audiences like never before and nurture new leads through a progressive sales funnel. Showcase your expertise and knowledge by generating compelling content that is highly attractive to your target audience and fulfils a need and will raise awareness of your business with your customers. When they are ready to engage you should look to provide a tailored journey from lead to happy client. Attract potential clients when they are researching by establishing a need or challenge. Publish fantastic, evergreen content that will provide a resource for the user and help them solve their problems. Attract buyers to your website by providing helpful content that is of value. Once you have their attention opened communication, learn more about the prospect and incentivise engagement with another piece of content or offer to provide further value. Help get your new leads over the line by learning more about them and tailoring your offering to suit their needs, just be there. Delight new clients with not only a fantastic service but the after sales and continued communication to enhance customer loyalty. A huge benefit of Inbound Marketing, that is often overlooked, is compound return. You can expect returns to be fairly small in an Inbound Campaigns infancy, but over time the campaign will grow and continue to generate traction. As long as you are producing high-quality evergreen content, a blog post published a year ago will still generate traffic. This is in stark contrast to Outbound Marketing where results will drop off or campaign stop working the minute you stop investing in them. In this day and age, it’s clear the inbound marketing efforts resonate better with buyers. When done correctly, inbound campaigns can offer a lower cost per acquisition and provide an ongoing return. With that in mind, it should be a core principle of any SME’s marketing strategy. While outbound can be seen as slightly dated, it’s not to be ignored and can be a powerful weapon in the marketer’s arsenal. A modern effective marketing strategy should focus on Inbound Marketing but allow some room for highly tailored Outbound efforts. Get more great insight from our dedicated Inbound Marketing page. As a certified HubSpot Partner Agency you can be assured our advice is backed up by the world-leading software and from over 15 years helping businesses achieve their goals.